Like any professional situation, you need to be well presented and organised to create a great impression – for which a binder works perfectly. If you have a bespoke binder incorporating your business guidelines with a logo, colour palette, typography and visual styling, this would help you stand out from your competitors and makes you memorable when meeting potential clients. What a great way to showcase your previous work to clients with your very own portfolio binder. In comparison to a printed brochure, the content for each binder can vary, making it easier to update more frequently depending on the needs of a particular client. There are plenty of ways to present clients with what you have been working on. Having a binder to showcase your proposal is likely to have a bigger impact, which would allow them to get a better view of the content. This also allows your client to visualise the idea you are selling to them. This is an ideal one if you are exhibiting at a tradeshow as you can not only showcase your products and services in a binder but you can also hand them out as a promotional take away. 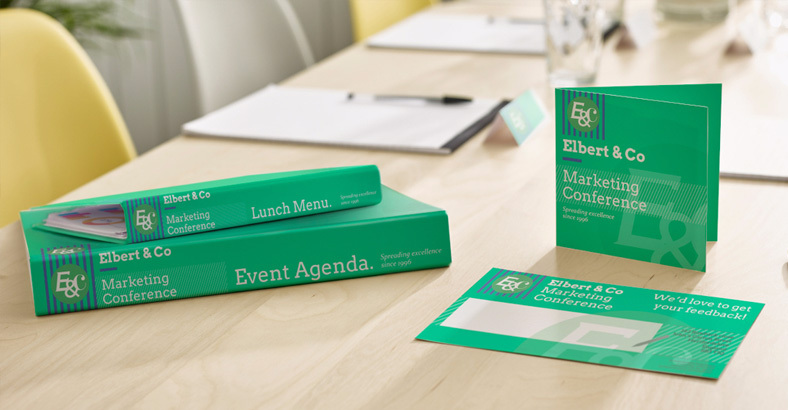 The binders would act as a memento from the event, clearly standing out from any promotional materials given by your competitors. Got new members of staff? The best way to get them immersed in your company is by giving them a dedicated welcome pack. A binder containing all sorts of helpful materials to aid them to get passionate about your business, making them feel accepted and a valued member. Has this inspired you to get your very own bespoke binders? Then why don’t you allow Avery WePrint to print them for you? We offer an extensive range, including A4 and A5 sizes with various spine widths. They are produced using photo quality digital printing! The good thing about all of this is you can upload your very own design via PDF with ease. Your design will be saved for your convenience whenever you need to reorder.